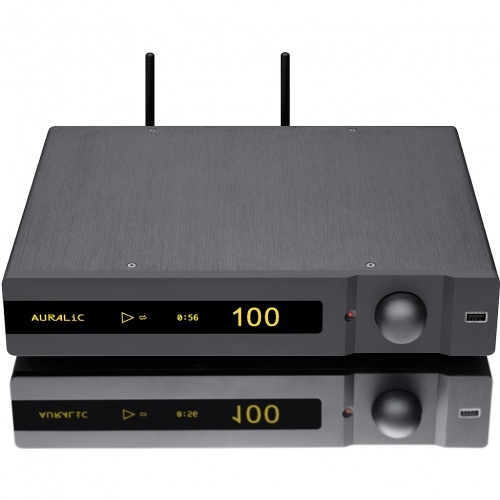 POLARIS defines the AURALiC brand: innovative technology, great sound, superb user experience, and excellent value. 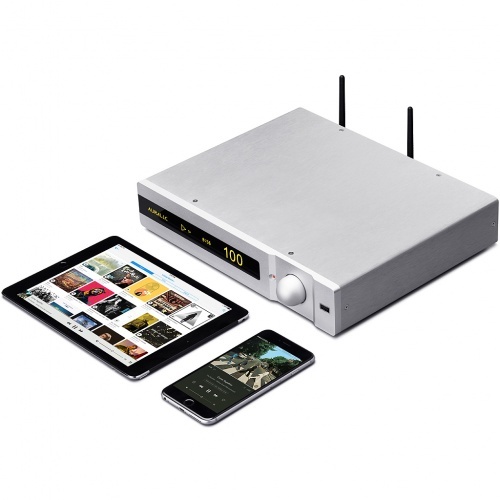 It is a wireless streamer, a music server, a DAC, a pre-amplifier and a stereo power amplifier – the ultimate solution for music lovers seeking high quality streaming from a single, compact audio component. It has seventeen inputs channels comprising streaming, digital and analog sources. The internal DAC, incorporating AURALiC Flexible Filters and Femto Master Clock, supports Quad-Rate DSD and PCM up to 32Bit/384K. The powerful internal stereo amplifier module can deliver 120 watts per channel into 8 ohms, 180 watts per channel into 4 ohms continuous power with exceptionally low distortion- sufficient for the most demanding loudspeakers. POLARIS utilizes AURALiC’s award-winning Lightning Streaming Platform. Launched in 2014, Lightning Streaming is industry’s first streaming solution that supports Quad-Rate DSD, PCM up to 32Bit/384K through Wi-Fi network. Lightning Streaming offers several innovative and unique features such as Gapless Playback, On-Device Playlist, Memory Cache and Bit-Perfect Multi-Room functions. This on-going platform is maintained, and continually developed by AURALiC’s in-house software R&D team to ensure customers are regularly updated with new features through the product’s automatic software update system. "The room was a partnership of Auralic and Spendor. It immediately felt like a room that you wanted to go into and listen and was comfortable, with that 'sitting down at home' feel to it. Richard from Auralic was manning the room when we visited and, with a fantastic disregard for audiophile traditions, whacked on some banging electronic tunes. The Auralic Polaris all in one unit alongside the Spendor D7 floorstanders was an excellent system. The sound was precise and fast and most importantly great fun. There was a stream of people coming in to listen, notably a youthful crowd while we were there, just showing that more traditional manufacturers like Spendor can move with the times and attract a younger audience. We could have stayed in their a lot longer than we did and were very impressed by what is an affordable and liveable-with real world system, a high end sound at not an astronomical price. This is, to be fair, is the way hifi seems to be (and needs to be) going, a great balance between quality sound and listening experience and actually having a hifi that you don't have to let take over your whole living space. I feel that it is this approach, delivering these kind of products that will ensure there is still a hifi industry for us all to enjoy down the line. 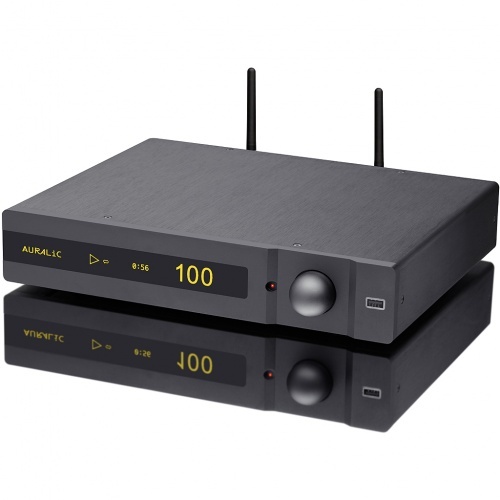 Auralic and Spendor, you guys make a great team, keep up the good work....Hifi Pig Loves You!" POLARIS utilizes AURALiC’s award-winning Lightning Streaming Platform. Launched in 2014, Lightning Streaming is industry’s first streaming solution that supports Quad-Rate DSD, PCM up to 32Bit/384K through Wi-Fi network. Lightning Streaming offers several innovative and unique features such as Gapless Playback, On-Device Playlist, Memory Cache and Bit-Perfect Multi-Room functions. This on-going platform is maintained, and continually developed by AURALiC’s in-house software R&D team to ensure customers are regularly updated with new features through the product’s automatic software update system. POLARIS can act as home music center for virtually all input source. It read music stored on USB drive, internal hard disk, network shared folder and DLNA/UPnP music server. By joint use with Lightning DS, you can also stream TIDAL, Qobuz and listen to Internet Radio at any time. POLARIS’s AirPlay, Songcast and Bluetooth inputs provide alternative way to stream your favorite music from Apple Music, Spotify and other service providers through smartphone or computer. POLARIS also work as Roon Ready endpoint to use with Roon software if necessary, bringing you a new way to discover and listen to music. 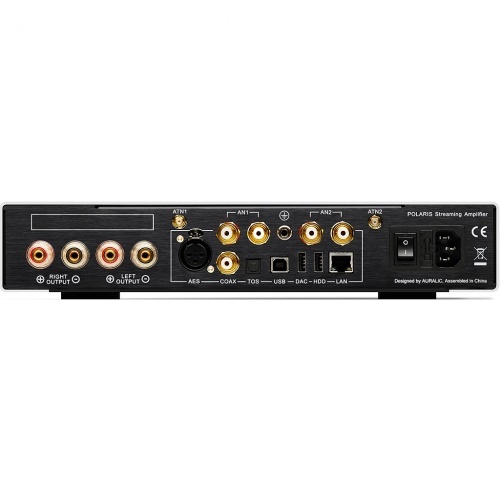 The rest of inputs includes AES/EBU, Coaxial, Toslink and USB connection to computer working as USB DAC. When ordering POLARIS, you can add a 2’5-inch hard disk drive or solid state drive as internal music storage as an option, turning POLARIS into a full function music server. Since there is no capacity limitation, you can always purchase POLARIS and install the storage by yourself. POLARIS is equipped with two pairs of multi-function RCA connectors - these two stereo pairs of analog channels can be configured as a phono stage input, a line stage input or pre-amplifier output through the product settings menu. Digital inputs include AES/EBU, Coaxial, Toslink and a USB connection to a computer working as a standalone USB DAC. POLARIS is powered by AURALiC's proprietary Tesla hardware platform that includes a Quad-Core Coretex-A9 processor running at 1GHz, 1GB DDR3 onboard memory and 4GB system storage. The Tesla platform has a calculation ability of 25,000 MIPS, more than enough to decode a vast spectrum of audio formats, including AAC, AIFF, ALAC, APE, DIFF, DSF, FLAC, MP3, OGG, WAV, WV and WMA. AURALiC has chosen this platform for its flexibility and long term support consideration. Future features planned include DSD Upsampling, Room Acoustic Treatment. All these features can be delivered through automatic online updates without user’s attention. The dual-frequency Femto Master Clock inside the POLARIS is specially designed and optimized for its ESS Sabre DAC chip: with one frequency for playing music with a sampling rate which is the multiple of 44.1K, and a second for 48K, making it possible for the POLARIS to be able to lock on with highest clock precision (equal to the VEGA’s “EXACT” mode) at all time without dropouts. The Femto Master Clock, which is powered by a 9uV extremely low noise dedicated power supply, has a very low phase noise performance. It not only has dramatically low phase noise, which is only at -151dBc/Hz level, but also an excellent 100Hz offset noise level which is only -115dBc/Hz. Driven by such a high performance clock, the POLARIS can bring you vivid music with natural detail and a solid sound image. 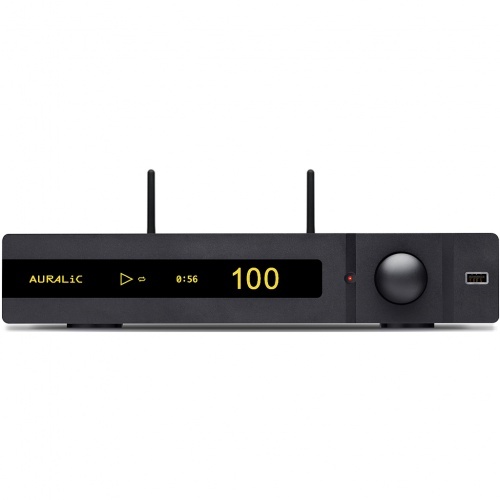 AURALiC is introducing another innovative technology: Hybrid Volume Control for POLARIS. The Hybrid Volume Control uses both analog and digital volume control together for optimum audio performance and the best possible sound quality. 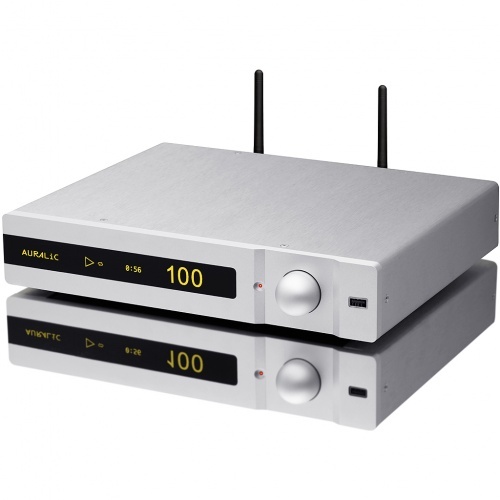 The analog attenuators reduce the signal level in 12dB steps whilst the DAC's internal digital volume control handles small amounts of volume change within each step. 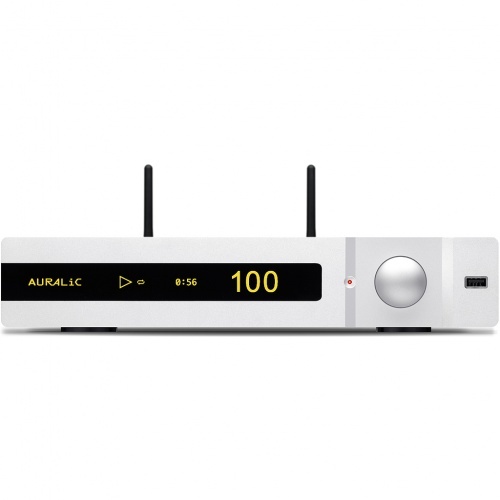 By using this technology, the DAC chip always operates in the best performance range, bringing much lower distortion, better dynamic range and high sound quality at low volume levels. POLARIS has four built-in filter modes which allows its user to customize sound best befitting their personal preference. Those filter modes were developed from AURALiC’s well known Flexible Filter Mode in the VEGA Digital Audio Processor, with each containing several digital filters optimized for a corresponding sampling rate. Flexible Filter Mode was developed under AURALiC's subjective auditory sense and objective testing data relationship models, to optimize the listening experience for different music and format. The “Precise” mode exhibits perfect in-band ripple and out-band attenuation performance, while the “Smooth” mode is better for overall enjoyment as it has no 'pre-ringing' effect. The other two modes, named “Dynamic” and “Balance” are optimized for different music formats as well. Power Consumption: Sleep: <10W, Playback: 450W at max. FREE delivery via DPD Local By 12pm on orders to value over £300, including one hour delivery window service 'Predict & Follow My Parcel'. Royal Mail Special Delivery By 1pm costs between £5.00 - £10.00 on orders to value under £300, dependent on weight. Saturday or Sunday delivery available upon request for supplemental charge. £25 delivery charge 'Flat Fee' via DHL Europe by Road service (3-5 days) which provides comprehensive tracking of shipments online. £60 delivery charge 'Flat Fee' via DHL Europe by Air service (1-2 days) which provides comprehensive tracking of shipments online. £100 delivery charge 'Flat Fee' via DHL international 'Day Definite' service per parcel. Receiver is responsible for the payment of local Duties and Taxes. Full manufacturer's warranty on all new purchases. Standard warranty is typically 2 years with some goods coming with 6 years manufacturer's warranty. Goods purchased in UK and EU are covered by the Consumer Contracts Regulations. Fill in the form below to reserve this item for purchase in store. If you have seen one of our products cheaper elsewhere, let us know. We will check it out and match the price. Simply fill in the following form and click 'Submit' to send it to our staff. Find out about our latest news and special offers.